There are two dominant types of projectile points that have been found in and around the pile dwelling at Alvastra. These are commonly referred to as tanged arrowheads and traverse arrowheads. 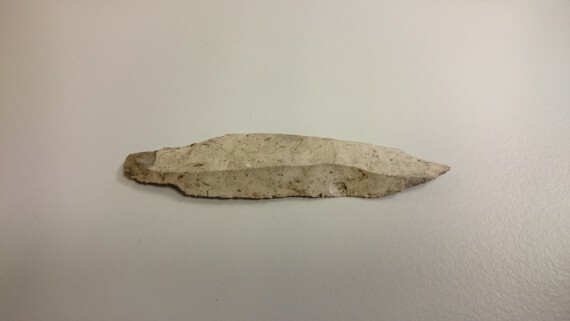 Tanged arrowhead with fire damage from Alvastra pile dwelling. Tanged arrowheads are probably closest related to the Pitted Ware culture and date to the Middle Neolithic. Transverse arrowheads, however, can date anywhere from the Late Mesolithic to the Late Neolithic and can be found in numerous cultural contexts over a large part of Scandinavia, including Funnel Beaker and Pitted Ware sites. Transverse arrowhead with fire damage from Alvastra pile dwelling. Both projectile point types are based on a blade technology, having been pressed from specialized lithic cores made of flint, or other suitable lithic materials, such as chert or quartzite and then finished by pressure-flaking retouch. Arrowheads were used together with a bow and arrow in order to hunt animals as a dietary supplement to grown and gathered crops in the area. 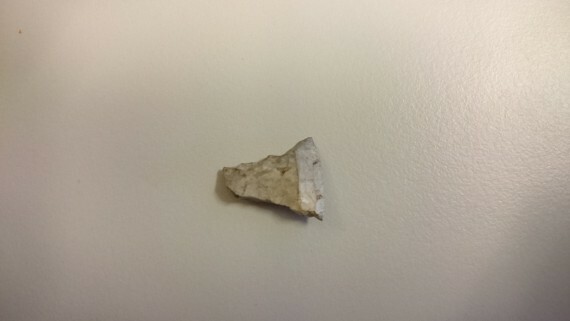 Many of the arrowheads also show signs of having been burned in a fire, which could have resulted from either cooking or ritual activity within the pile dwelling. It is interesting that both arrowhead types appear within the same cultural contexts at Alvastra, as it seems both were an effective weapon type. One can speculate as to whether two groups of people were meeting at the site, each with their own characteristic tool-set, or if one or both groups simply made and used both styles of arrowhead interchangeably.